VisionMaster AP212 incorporates high-resolution PCB positioning with the sophisticated, 3-dimensional measurement technology found in ASC International's VisionMaster 150. The system provides electronics manufacturers with most class. The AP212 eliminates operator handling problems that can be associated with other off-line measurement and inspection systems, improving measurement repeatability and reproducibility. VisionMaster is a sophisticated 3-dimensional measurement system coupled with an intuitive WindowsR user interface, and packaged in a rugged, bench-top system designed for the electronics production floor. With only a few minutes training, an operator can perform accurate 3D measurements of solder paste pads, BGA's and many other PCB features. VisionMaster's completely automatic measurement process eliminates operator errors and offers excellent measurement repeatability. LaserVision SP2D combines laser measurement accuracy with Automatic Data Collection (ADC) for real-time control of SMT stencil printing. The SP2D with ADC automatically calculates height and width on all solder paste features in the system's field of view. This eliminates operator subjectivity, the most common variable associated with manual solder paste measurement. 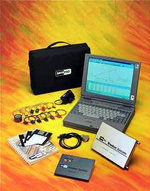 With its Windows 95R interface, the SP2D is easy to learn and use, making it an exceptional value for the SMT manufacturer concerned with improving printing and production yields. Fast sampling rate, convenient Stop/Start buttons, LED lights and ~60,000 readings +/-1 degree C accuracy gives process information you can trust. Y2K ready The world's most comprehensive, yet easy to use software available for electronic assembly profiling. Made of high-grade stainless steel with secure button closures. Protects the data logger inside the oven. Space-age insulation gives the best weight/protection ratio available.